In January we celebrated Jeffrey’s birthday at J.Gilbert’s, a local steakhouse. It is one of our favorite splurge restaurants. This was the first time we had taken our boys with us to the restaurant, but we decided that it was time for them to get dressed up and attend a “fancy” dinner. I also knew that even thought the food is expensive my boys would appreciate and eat the food. We were all quite pleased with our meal. 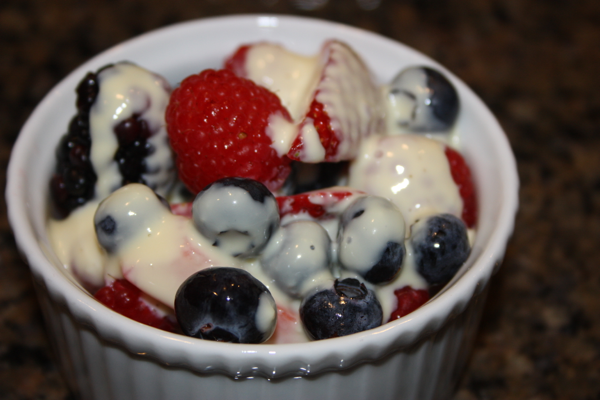 When it came time for dessert, Tyler choose the berries and cream and found a new love…Creme Anglaise. Tyler has always loved fresh berries though when they were topped with Creme Anglaise he was definitely in heaven. He enjoyed it so much that we decided to give it a try at home. We were not disappointed and it is a yummy and slightly indulgent treat. At the same time, you don’t feel bad about enjoying it because you will eat it with a big bowl of fresh berries. Combine milk and cream in heavy medium saucepan. Bring mixture to a simmer. Remove from heat and whisk in vanilla. Whisk egg yolks and sugar in a medium bowl to blend. Gradually whisk hot milk mixture into yolk mixture. Return custard to saucepan. Stir over low heat until custard thickens and leaves path on back of spoon when finger is drawn across, about 5 minutes. Cover and chill. Serve with fresh berries.